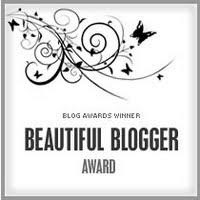 I have been given this blog award by Caroline of Standing in the Sunlight. Thanks Caroline! I am to tell you all seven random things about me, then tag seven other bloggers. 1. I have read only one Jane Austen book and that was Pride & Prejudice. 2. My favorite Elizabeth Gaskell film is the BBC North & South (2004). 3. My favorite Narnian is Reepicheep! I loved him in Prince Caspian and can't wait to see him in The Voyage of the Dawn Treader. But guess what?!? I have a fear of mice. LOL! 4. I have a weakness for anything that has polka-dots on it. 5. We use to have a dog named Braveheart (he was a yellow lab). He was named after William Wallace. But we all said, "We should have called him, Chickenheart. For he is such a chicken." You see, he was not a brave dog at all. He was scared of mice, vole's, and stairs. 6. My favorite summer sport is Baseball. My favorite team is the Detroit Tigers. Thank you so much Ashley! :) I really, really enjoy your blog - its such fun! Michaela - Well, you will save the award (picture in this post), to your computer. Then upload it into a post. Then you post seven random things about yourself, then tag seven other bloggers (you can do more, or less). Then go let them all know that you tagged them. =) Does this help? haha - yes! Thanks. ;) I wasn't sure if I was just supposed to fill out the tag or grab the award too. I am very honored that you like my blog!